During the dry season in the Kalalé District of Northern Benin, water scarcity-related issues (for example the inability to irrigate fields and have access to potable drinking water) become a systematic dilemma for smallholder farmers – especially women farmers. In response to this situation, since 2007, a triumvirate of NGOs assisted group-based women farmers to adopt solar powered drip irrigation systems for the production of horticultural products on small communal gardens with the intention to reduce the vulnerabilities associated with rainfed agriculture. This paper will focus on the introduction of this new technology in the semi-arid region of West Africa. Relevance to Development Studies In rural communities, women farmers are of central importance because of their role as food producers and income earners for their families. Their access to water for irrigation can have crucial long-term impacts in terms of demographics, diets and the diversification of their income bases. 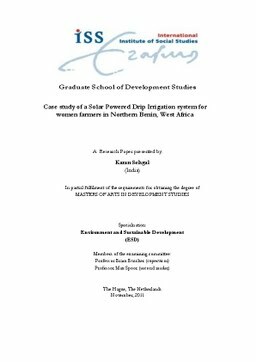 Since agriculture is the main source of revenue for women farmers, this paper seeks to understand the link between access to irrigation services (in particular small-scale solar powered drip irrigation) and improved food security and income levels, focusing on the role of women farmers. Not much has been written on the relationship between women (in semi-arid and arid zones where prolonged periods of drought affect crop production patterns) and access to irrigation (Upadhyay, 2005). Thus, this paper contributes to a better understanding of the intricate relationship between water development, food security and rural poverty alleviation.